With skin tag removal being considered a cosmetic procedure, and therefore not covered by health insurance, people are looking for alternative skin tag removal options to safely remove skin tags. Ligation is a common and simple method of removing skin tags. Some people will do the same thing by tying a piece of dental floss or wool around the base of the skin tag to remove it. TagBands have made this a much easier process. We have put together this TagBand review for you to have a full overview of the product. Micro Tagband – The smaller Micro Tagbands are used for small to medium skin tags which are 2- 4mm in size. Tagband work by cutting off the blood supply to the skin tag, causing it to turn black and fall off. Skin tags are made up of blood vessels and collagen. If you cut off the supply of blood to those vessels, the skin tag can no longer survive. TagBands are also considered natural because they don’t use any chemicals or synthetic ingredients. They simply offer an easy way to ligate the skin tag and cause it to fall off. It is a fairly pain-free process although you may feel a slight pinching feeling at the site where the TagBand sits. The Tagband is such a popular method because of it efficacy. Like any product, it has its pros and cons but one of the big pros of TagBands is that they work every time. While putting together this TagBand review, we found that they are so confident of their product, they have a 60-day full money back guarantee. Many users who have tried other products, and found them not to work whether it’s because they became impatient or the product wasn’t right for their skin type, found that TagBands work every time. They also only require a 1-time application, so you don’t need to be fussing with constantly managing your skin tags. Place the band at the base of the skin tags and wait for it to fall off. This takes about 4 – 7 days. In some cases, with larger skin tags, some people have found they have had to apply a band a second time in order for the whole skin tag to completely fall off. The first thing to do before starting to remove your skin tag is to clean the area well. Using one of the supplied cleaning pads, wipe the skin tag and the surrounding area. Prepare the band and the cone by pushing one of the bands onto the cone and sliding it up to the wide end of the cone. Slide the band remover on and make sure it touches the band. Using the band remover push the band closer to the edge of the cone. The band will be securely fastened to the base of the skin tag, the band will start cutting off the skin tags blood supply right away and will cause the skin tag to fall off after a few days. If you any skin issue diagnosis such as skin cancer. If your skin tag is smaller than 2 mm. 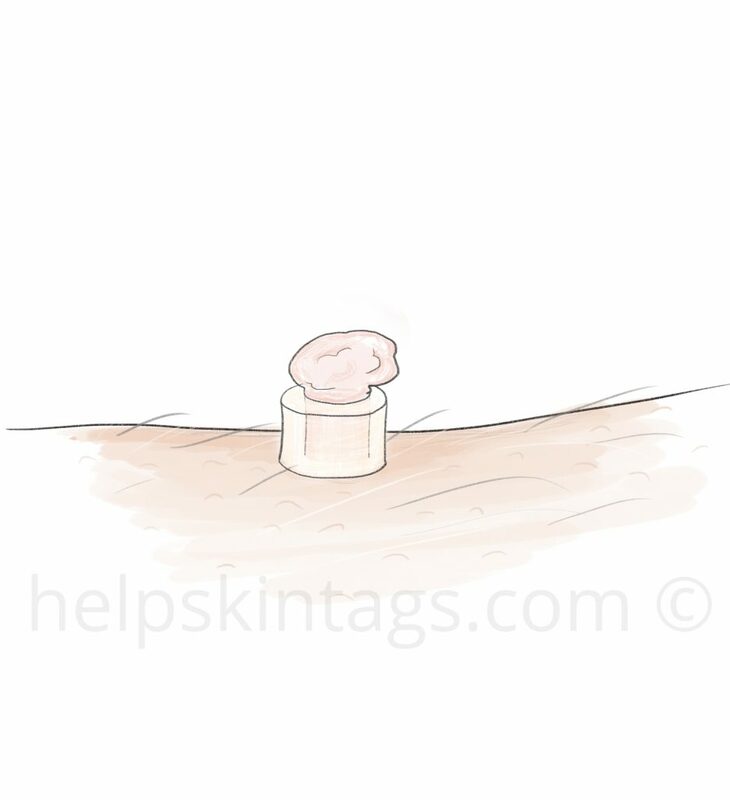 TagBands are not intended for use on tiny skin tags as they may not sit tightly enough around the base. Around the eye and eyelid. These are sensitive areas and you should consult your doctor about removing these skin tags. On any skin growth other than skin tags. Skin tags are intended to be used only with skin tags. If you have an allergy to rubber. The TagBands are made of rubber, so it is best to avoid them rather than risk an allergic reaction.